The first thing a person should do is to prevent a sun burn. Use sunscreen and wear protective clothing. If you should notice your skin is burning, go indoors or put on protective clothing or sun screen. To help soothe and treat a sunburn, start treating it as soon as possible. 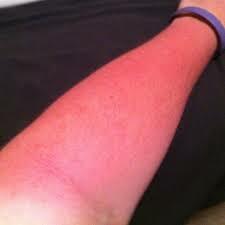 A sunburn can seem like a temporary problem; however, it is not. A sunburn is the result of exposure of too much of the sun’s ultraviolet rays which can cause damage to the skin. This can increase your risk for skin cancer. Take frequent cool baths or showers to help relieve the pain. Pat dry and apply moisturizer. This helps trap water in your skin. Use a moisturizer that contains aloe vera or soy to help soothe the sunburned skin. You may want to apply a hydrocortisone cream that you can buy without a prescription. Consider taking over-the-counter pain medicine to help reduce any swelling, redness and discomfort. If you are experiencing any of these symptoms, visit your Rio Grande Urgent Care for immediate medical care. If you or anyone experiences chest pain, dizziness, confusion, trouble breathing or severe burns call 9-1-1 immediately! !